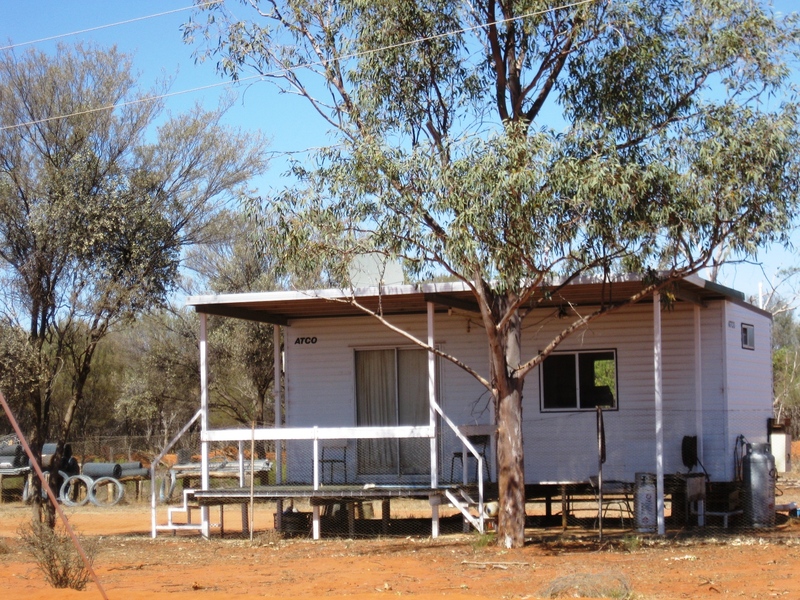 Kilcowera and Zenonie Stations are relatively small compared to the vastness of the properties in northern Australia. 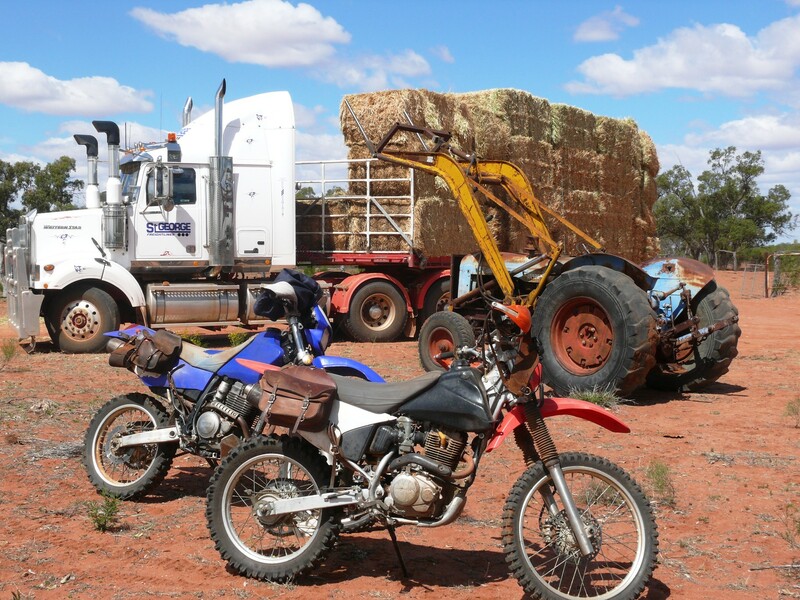 They are situated in a fairly arid landscape in the SW of Queensland. I have heard it called Heartbreak Corner on more than one occasion. But I’m guessing there are many other places in Australia with similar nicknames. My husband has lived out here all his life and I have been here now for nearly 40 years. During that time we have seen a lot of dry years and have been drought declared 3 times. Being officially in drought enables us to access some subsidies from either the state or federal government. The only one we ever found useful was the interest subsidy which was scrapped many years ago. Early February 2019 has seen many parts of northern Queensland awash with far too much rain, roads cut, towns cut off, dams and rivers raging and cattle and sheep starving to death or drowning. Conversely large parts of QLD have not received any rain at all for months and months and months. Here at Kilcowera we registered just 91 mms during 2018- this is our sixth very dry year in a row. We have been destocking year after year, only keeping a couple of hundred young cows. It sure is a land of drought and flooding rain. And dust storms and fires and flies and ants. A fat happy cow in the good times. We, at the other end of Queensland made the decision to sell all our remaining stock at the beginning of 2019. Well, actually we had decided in late November that if there was no rain, they would have to go. So in 45 to 47 degree heat we were mustering and processing, watering and feeding the last of our cows and calves, putting them on trucks and sending them to the first and second sale of the new year at the Roma Saleyards. The young cows were all still in good condition and we were relieved to see them off the place, with no rain in sight and still months of hot weather they would not have gotten through the rest of summer. There is not a scrap of grass, hardly any burr left only the Mulga and it too is dying in places. So we’re hobby farmers now with only a handful of cows and calves left and one bull. The cows are scratching around out in a paddock that got a storm about a month ago and we have hay and molasses for them, so they will do ok. But it will take us a long time to be back in business again. If ever. 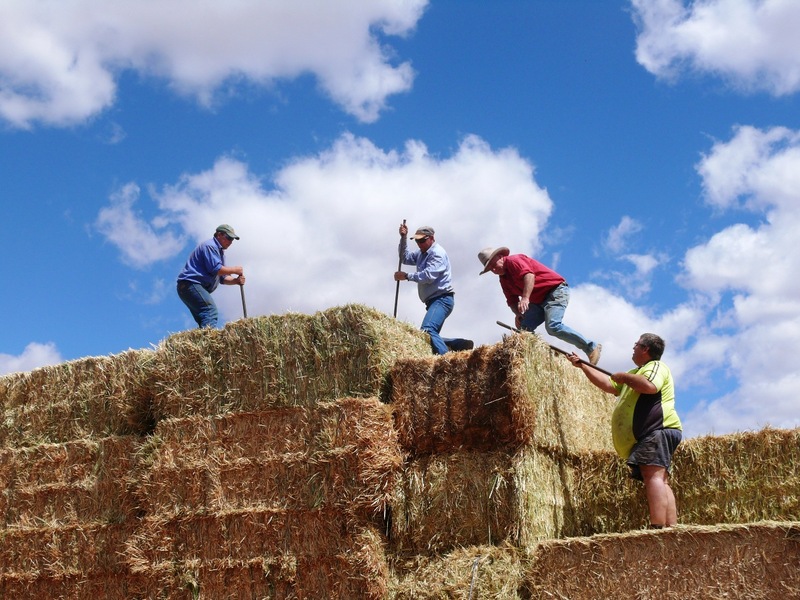 There are different ways to handle drought and what each individual primary producer decides to do must suit them, how they run their property, the type of stock they have and even the type of country they have. 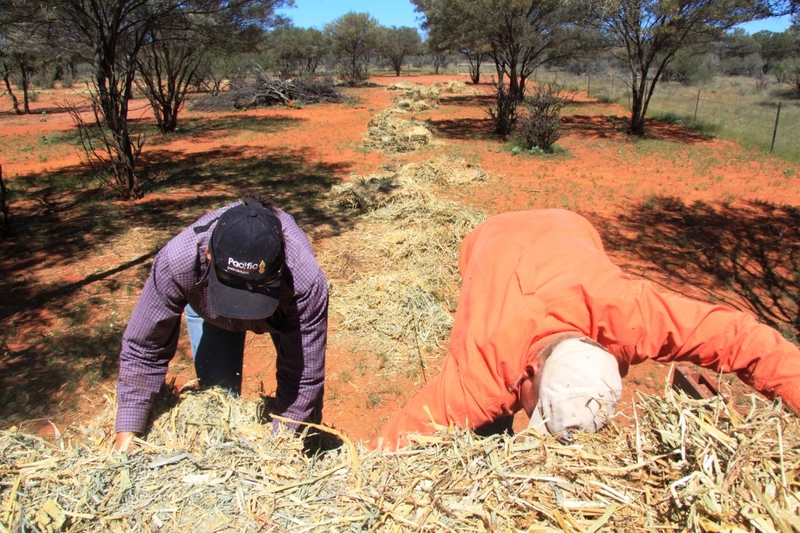 How far they are from markets, how far it is to cart feed or water for their stock, do they have adequate Mulga? To push the Mulga or not? Droving is another option or agistment if there is any feed to be had. Feeding out some donated hay, unfortunately it was not very edible, even to our hungry stock. As I sit here writing this, yet another dust storm has loomed up from the south, taking and bringing dust and sand, making the house filthy once more and choking the dying Mulga trees. Just another nail in the coffin. But my Hubby has found a new rainfall chart for the year and added it to the last 40. Let’s all hope that we get a chance to make a few marks on it this year. I think this blog has run its course and this will be the last post I put up. We have a Facebook page for Kilcowera and a website with its own blog so you can still keep up to date with all that happens down on the station. wwwkilcowera.com.au Thanks to those who have commented on my posts over the years! Cheers from Toni at Kilcowera. 2016 nearly done and dusted. Another year draws to an end, that means I have lived on Kilcowera for 36 years, I’m another year older and looking forward to the Australian Open Tennis! It’s the one sport that I really like to watch. Last Christmas we had one daughter, her hubby and toddler here to help us celebrate all the great things about Christmas time. It’s nice to have family with you at such times. Makes it more meaningful. This year we have invited our elderly neighbours to come and share the day and some lunch with us. No doubt we will also appreciate the air conditioner as it is predicted to be 39 degrees ( ooh only 39! ) That’s not too bad! We have had a mixed year. It started off really dry, so we sold most of our cattle then it started to rain and kept it right up through most of the winter which spoilt our tourist season somewhat as visitors couldn’t get here. Or couldn’t leave when they did get here. Then we had the most spectacular display of wildflowers for months on end. I have had some broken ribs, Greg has had a buster off the horse but we did have a break away from the place each so that was nice. We also have a new grandchild. Our little plane suffered a mishap when a birds, big, mud nest fell onto it and put a very large hole in the elevator. Our Carbon farming project inches forward with all the speed of a glacier in Antarctica in the ice age. We have been hooked up to the NBN via the Skymuster satellite – I will reserve my judgment on that for the time being, it too has it’s ups and downs! My lawn is looking fantastic, the garden pretty good too. But all in all not a bad year at all. Best wishes to you all and thank you so much for being our friends, family, visitors or just interested people in our way of life in the Outback. Bless you all and Happy Christmas! I always have a bit of a giggle to myself when the odd visitor whinges about the gates on the drive into Kilcowera. All three of them. There has been many a suggestion about putting ramps or grids in to make the experience more user friendly. Hard luck! The middle gate on the way in was a real doozy – unless you knew just how to treat it, it would give the unwary a pretty good workout. You bring one side to the middle, head over to the other half and by the time you have it in the middle the first half has swung open again. We in the bush call these athletic gates. Rest easy – it is perfectly balanced now and operates in a perfectly boring and mundane manner. One chap commented it was worth the camping fee just to watch his wife doing battle with it! Back in the eighties there were 14 gates on the road to town. But being young and enthusiastic this didn’t deter us one iota. After all the bloke always drove and the missus and the kids did the gates! The only exception was if the missus was getting a bit long in the tooth or was done up in her finery and had high heels on. But this was a rarity. The other exception was when the missus had to both, drive home in the dark and do the gates because himself had a load on and was snoring in the seat next to her! We had one gate not too far from the house at the back of the horse paddock, made of wire and logs. I swear it was the heaviest and most cumbersome gate ever invented. Only a few years ago Greg replaced it with a swinging gate so our visitors had an easier time with it. But I know the ulterior motive was so the bloody thing would be shut properly, not in some half baked way because they couldn’t work out what to do with it! This is something we have noticed over the years – people can undo a gate, but getting it back together the correct way is much more challenging! I suppose we all have our fields of expertise. Doing a water run on the place also entails opening and shutting lots of them – sometimes up to twenty ! 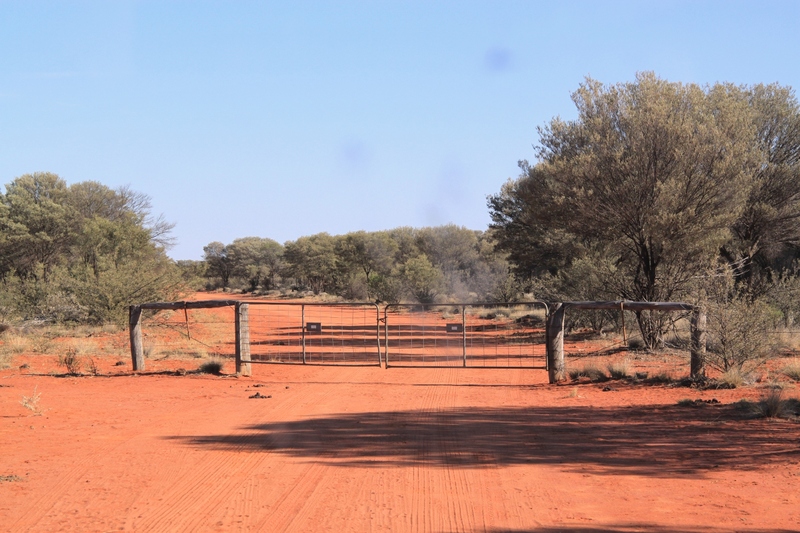 The Dingo Barrier Fence boys have perfected the art of not going through anymore gates than they have to on their inspections of the fence. After all they don’t have to pay for the fuel and it’s not their car they are driving. They will drive 10 times the distance to get somewhere and to get out of opening and shutting a gate. And there are always two of them, so it’s not like it’s one bloke has to open the gate, get back in the car, drive through and shut the gate. We just live with them, they don’t bother us too much, the gates are there, they need to be open and shut and that’s all there is to it.